We have some exciting news to share with you - and it might just take you by surprise! We explain what the team has been working on, and more ways for you to help. Yes, we're back, and it couldn't be a more exciting time for the project. Read on to find out what we've been up to and how you can help shape the future of the game. During this long, quiet spell, we have been hard at work reshuffling the team and refocusing on getting a playable tech demo built and ready as soon as possible. And with that, we have a surprise for you: we are proud to announce that the first playable tech demo is now available! It comes slightly earlier in this development stage than we had planned, but we felt that our latest internal build had enough features that we could share it with all of you. This does, however, mean that what you're getting is a VERY early build that is rough around the edges and makes heavy use of placeholders. As such, we must stress that this build does NOT represent final quality and any shape or form. Below, we'll explain what's in this build, what's missing, and what we plan to include in future builds. 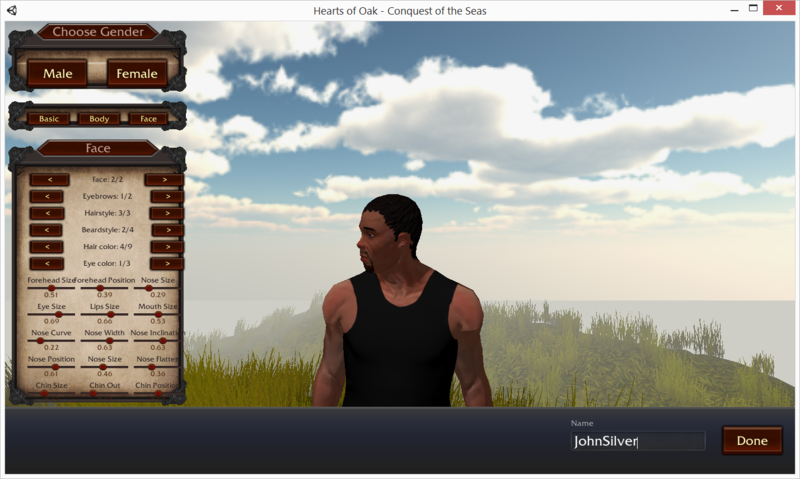 Using UMA (the Unity Multi-purpose Avatar system), we can now generate a vast range of character models on the fly, without needing to model each one individually. This also allows for deep customisation, which is opened up to the player in-game with the UMAzing asset from the Unity store. When you select 'Create Character' in the main menu, you will be taken to a screen that lets you generate a random character and then customise them to your liking. At the moment, the choice of clothing is very limited, but in later builds, we will improve this by adding custom clothing items including hats, coats, trousers and shoes that suit the game world better. Once you've saved your character, you can select them in the 'Play Game' menu, and choose the mode you want to play (Single-player recommended). 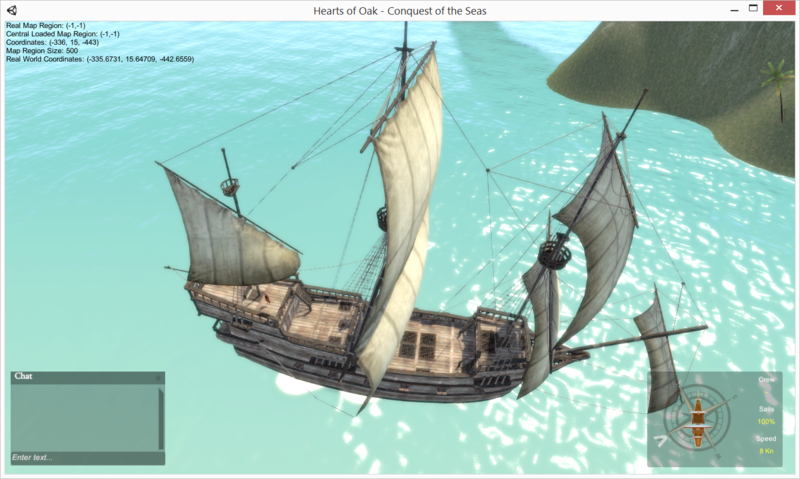 Sailing will be one of the core mechanics of Hearts of Oak, and this build includes a very early system that lets you take command of a ship and use the W, A, S and D keys to steer and set the sails. Simply approach a nearby ship and click on it to take control. 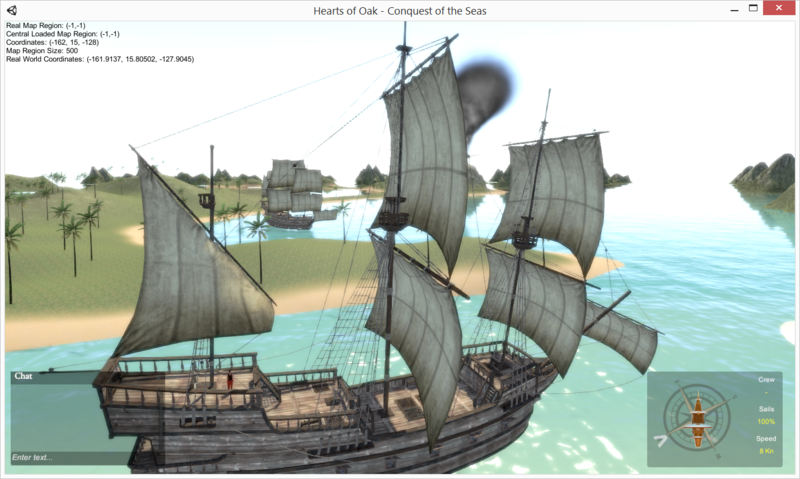 At this stage, there are no animations for the sails or other parts of the ship, so keep an eye on the 'Sails' value in the bottom right corner to see what 'percentage' of sails are currently set. In future builds, this system will be heavily modified to allow setting of individual sails, or cycling through a series of preset sail states, depending on your preferences. And, of course, expect to see sail animations and moving yards later on. If you're wondering what happened to the St Albans model, fear not! The galleon in this build is just standing in while we work out a few issues with importing the St Albans and getting her working properly. This build includes a sparsely detailed set of small islands to test the performance and feasibility of an open world environment. At present, objects are rendered within 2000m of the player's position, but this may change with further tests. You can sail to any island you can see in the same scene, without loading screens. Depending on how the performance holds up when scaled to include full Caribbean islands, this is essentially what we're aiming to achieve for the final game. As a test, we have included Unity 5's new UNET P2P networking system. This is mostly to allow developers to collaborate in a shared game world (hence the chat window), but eventually this can be expanded on to introduce full multiplayer modes. We only recommend giving this a try if you are familiar with Unity already, but depending on the amount of interest, we might be able to provide some tutorials on how to use this at a later date. This is another tool aimed at making development easier, which should allow our artists to add and move assets to the game while in the game itself. Currently, this only works if you have Unity installed, but in future it should offer a streamlined way for artists to populate islands with props, buildings and scenery. We should also explain at this point that we have a new approach to when and how new builds will be released. Our new lead developer is keen to release new builds on a monthly basis, which pushes the team to prioritise new content and features, and allows us to more rapidly prototype without getting bogged down on specific details. What this means is that, from this point on, we are aiming to have a new build ready towards the end of each month, and a news article to go with it. Additional articles might be posted between releases, but that will depend on the time and resources we have. We are currently working towards the full Proof-of-Concept Demo that we hinted at in the past, and although we can't be sure when it will be ready, we will still be releasing another build next month in whatever form it takes. As of now, there are two ways you can help with the development of the game: either through testing the new build, or contributing to future builds. - Performance - How well does the game run on your PC? What settings are you using (screen resolution etc.) and what are your PC specs? - Gameplay - Is the game easy to play? Are the controls intuitive? - Bugs and glitches - Have you experienced anything unusual while playing? 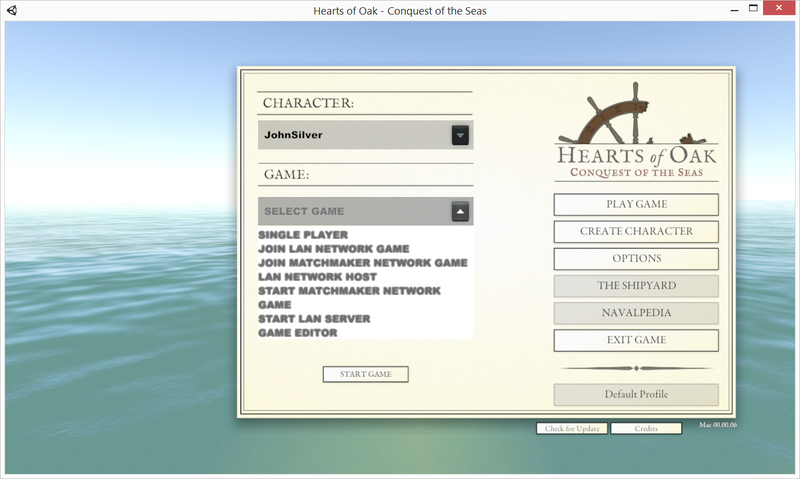 - Networking - Can you successfully set up a game with two or more players online? Does the game perform well during multiplayer? All feedback, both positive and negative, is greatly appreciated. We remind you that this build uses placeholders though, so please bear that in mind when posting any comments about graphics or model quality. If, on the other hand, you'd like to join our development team and help shape the game's future, then don't hesitate to contact us through our recruitment forum. As we rely entirely on volunteers, the more people we can get working on the game, the better. If you're familiar with C# and/or working with scripts in Unity, you can help! If you're interested in working on the gameplay mechanics with our developers, and you have plenty of time to spare, you might be exactly who we need! We still need to produce an uncountable quantity of assets for the game, including props, architecture and ships. If you're an able 3D artist, we always have something for you to do. With the integration of the UMA character system, we will also need people to produce custom clothing items for the base characters. This will have a very noticeable effect on the visual quality of the game, so this is a high priority role! That's it for this month's progress; we'll have more updates for you soon! "The file you have selected (HoO.July2015.zip) is not available via any mirrors." EDIT: I tried The moddb download link and it works. The idiedb download link has no mirrors. lmao nice character creation :D. I got a crash though right after it I think when I pressed create to bring the weird anime fellow in life. hmm not sure if I do it now but, upload options? If you click 'Read More' on the download page, I've put an alternate download mirror there which you can try instead. YYEEAAAHHHH!!! Can't wait to try this out!